Was born in Johannesburg, South Africa and won the 1993 World Marathon Championships in Stuttgart only becoming a US citizen three weeks before that event making it one of the most emotional events at the Championships. Born during the apartheid regime, he was unable to compete outside of South Africa. He won 2 x national titles at the marathon and 2 x XC and ran his personal best marathon of 2:08:58 at the Port Elizabeth marathon in 1985. Due to the international boycott of South Africa during this time, Mark could not compete at the 1984 and 1988 Olympic Games for South Africa. In 1991, Mark won the Los Angeles Marathon in 2:10:29 and in 1993 he finished 6th in the Boston Marathon which qualified him for the U.S. team at the World Championships later that year. The founder and long time president of the Boulder Road Runners (founded 1979) moved to town in 1971. He has served as race director for numerous local events, including CU races, the Nike High Altitude Challenge, the Rocky Mountain Shootout Cross Country Meet, the Run for the Roses, 4th of July Run, the Boulder Memorial Hospital races, and several national meets. He has been associated with the Bolder Boulder since 1979, coached winners in the citizen’s race, the wheelchair race, and in the elite divisions. Rich has also served as distance coach for Ecuador at the 1996 Atlanta Olympics, as a track coach for the U.S. Army World Class Athlete Program, as Global Athletics Consultant for Reebok International and as Road Racing Athletes Consultant for Nike Inc. He has presented track and field clinics in Mexico City, Brazil, Rotterdam Holland, and Quito, Ecuador. Rich retired as director of intramural sports for the University of Colorado’s Student Recreation Center, a position he held from 1973 to 2006. Through the years at CU, he has served as assistant men’s track coach, head women’s cross country and track coach, and in many other capacities with the CU Recreation Center. Over many years, Rich has been a key figure in helping the local running community grow by bridging the gap between the elites and the beginners, integrating newcomers, and being part of many events. As a student at Oviedo High School, Jennifer was a 5 x state champion in track and 3 x state champion in cross country. She set Florida high school records in the mile, 2 mile, 5,000m and 3 mile events. 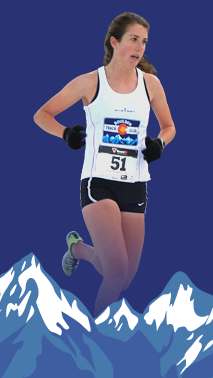 Jennifer attended and graduated from the University of Colorado and in her time at CU she was a 7 x All-American (4 x outdoor track, 2 x XC, 1 x indoor), 12 x All-Big 12 (9 x track, 3 x XC) and 7 x all-region (4 x track, 3 x XC). Jenny won a gold medal in the 1500m at the 2011 World Athletic Championships in Daegu, South Korea and a silver medal in the 1500m 2 years later at the 2013 World Athletic Championships in Moscow, Russia as well as representing the United States at the 2008 and 2012 Olympics Games. 2014 continued to be a stellar year for Jenny with a runner-up at the Boston New Balance Indoor Grand Prix 2 mile in 9:26.19, a 2nd place finish at the US Cross Country Championship in Boulder, a National 1500m title at the USA Outdoor Track and Field Championships and then on July 4, she became the 2nd fastest American 1500m runner ever by running 3:57.22 at the Diamond League meet in Paris. The year only ended on an even better note for Jenny with her winning the 2014 IAAF Diamond League title and the “Jackie Joyner Kersee” Award which is USA Track & Field’s highest accolade, presented annually to the outstanding U.S female track & field performer of the year. Benji ranked among the top 10 US marathoners during his athletic prime with 25 sub 2:20 marathon times recorded during that time. With a personal record of 2:09:57, Durden’s first marathon win came in 1977 in Columbia – South Carolina in 2:19.04 with his lifetime PR coming from the 1983 Boston Marathon where he finished 3rd. Benji’s big breakthrough came in the 1980 “Olympic Trials” where Benji finished second (2:10:40) against one of the deepest field of American marathoners ever assembled. Durden surged into the lead at the 19 mile mark and built up a 10sec advantage over the lead runners until he was caught the 23rd mile. The race was intended to determine the US Olympic team for the marathon at that summer’s 1980 Summer Olympics in Moscow, but the USA boycotted that Olympics and Benji missed out on competing. Benji did represent the USA at the 1983 World Championships, finishing 39th in the Marathon. ** The role of a BTC Patron is to actively promote the club and its mission statement. Patrons will be used in mentoring roles for our high performance team athletes by providing guidance, insight, support and encouragement in their quest for athletic excellence. “Every Patron of the BTC has a great story to tell” said High Perfomance Coach Lee Troop. “They were great athletes, they all come from different back grounds and they are great people. Their involvement with the club and some of our athletes will be so valuable in areas such as racing, preparation, life balance and never forgetting where you have come from and how hard you have to keep working in order to be successful. Our Patrons are one of our most valuable assets/ resources we have”.